Hugo Vigliotti brings humor to the program with his high-flying moves. BECKET — Oh, they’re back, those marvelous dancers of 3e étage, on loan from their day jobs at the Paris Opera Ballet. Directed and choreographed by fellow dancer Samuel Murez, the program at Jacob’s Pillow this week — a compendium of scenes and skits, some culled and tweaked from the troupe’s visit two years ago — is decidedly nontraditional. Affectionately titled “Le Pillow Thirteen,” this suite of playful weirdness may just as well be called Le Nouveau Vaudeville. There is much that is genuinely entertaining, though Murez has yet to find the perfect balance between dance and (mini-)drama. When they’re not performing in the straight sections, the performers appear as characters woven throughout to push a loose narrative that, we see in the end, is a warning against conformity. If the conceit occasionally wears thin, these formidably pedigreed dancers are always physically fascinating, whether executing the tours and allégro honed through years of fine classical training, or portraying Murez’s endearing mimes who conjure Buster Keaton with their comically slumpy postures and schlumpy gaits. “Mephisto,” the opening dance and the evening’s most formally balletic piece, takes cues from Andrea Turra’s Franz Liszt-inspired score and puts the dancers through some endurance-testing paces. The combination of dazzling big jumps and lightning petit allégro proved especially devilish for the three men on opening night, with many of their landings noticeably fudged. The two women fared better — the piece seems to call for pointe shoes, but they wear soft slippers and are therefore not quite as technically challenged as their male counterparts — although they too seemed tense. This uncharacteristically nervous beginning was trumped by the performers’ expertise in nearly every other moment: Any technical bobbles in “Quatre” were staged. This very tongue-in-cheek exhibition for four men is equal parts “Pas de Quatre,” “Push Comes to Shove,” and “Études.” It’s a subtle parody of the infamous rivalry of Romantic-era ballerinas combined with goofily slapstick ballet spoonerisms, with a hefty dose of flawless multiple pirouettes, lofting barrel turns, and hovering, etched batterie tossed off with faux-arrogant ease. The men are truly funny — Hugo Vigliotti nearly steals the show with his sprite-like shenanigans — as is Lydie Vareilhes as Cassandre, at first a discerning robot pursued by two geeky stereotypes, Pierre and Louis, in “La Danse Des Livres (Book Dance).” This makes her transition into a warm-blooded human (after she turns her back to us, takes a wrench to her gut, and clips some internal wires) in the following duet, “Thirst,” all the more poignant. 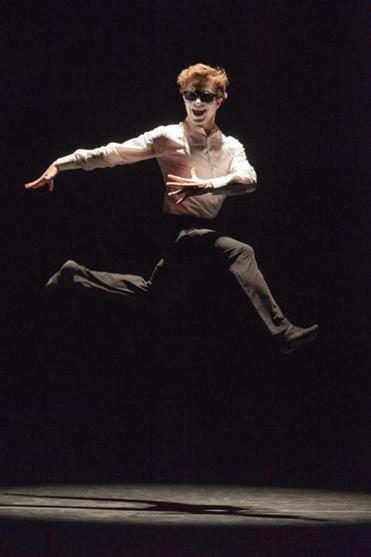 The program indicates that it is “years later”: The two wooers have morphed into one, dancer Takeru Coste as Pierre-Louis, and the now-fluid, now-halting pas de deux is shaded with the intimacy that comes with years while shadowed by a melancholy that portends a relationship’s demise. In “Processes of Intricacy,” an absorbing behind-the-scenes snippet of the never-ending studio work that is a dancer’s life, we see what may be traces of “Thirst’s” movements; sans the drama, Coste and his partner here, the elegant, gutsy Laura Hecquet, are like any other elite athletes in their top-notch prowess. Beautifully, we also see, that that other aspect inherent to dance — poetry — is always present, even in the daily grind.